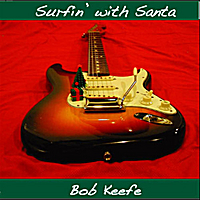 Surf Music. The first band I played in was a surf band. We played for my eighth-grade Spanish class. We played a New Year’s Eve gig that year, and the next year we played for our ninth grade dance. We split the bill with a much older band and blew them away. We came pretty close to winning the 7up Action Boys Battle of the Bands that year in Fresno, California. I played a 1964 Sunburst Fender Stratocaster through my 1965 Fender Super Reverb amplifier. I still own the ’64 Strat. From there, it was a whirlwind of musical styles: mid ‘60’s LA music scene bands, late ‘60’s San Francisco psychedelic bands, hard rock bands, ‘80’s cover bands, jazz for a few decades, three music degrees along the way, big band, guitar ensembles, college teaching, followed by a bunch of wedding bands. But it all comes back to my first love: Surf Music. splash tribute to the NTSU Guitar Ensemble. Surfing ‘round that Colorado spruce with The Astronauts. Traditional, with a splash of reverb. St. Nick goes to Malibu with The Gamblers and Moon Dawg. The Chantays meet the minimalists. Dashing through the snow with The Champs. Traditional. Bass quartet with reverb. Traditional. Surfing from Merry Olde England to Southern California. Jack Petersen: Thank you for showing me what a guitar can really do and for giving the guitar a front row seat in ensemble playing. Triads rule! Scott Cavanaugh (1950-2008): My surf music pal. From our love of the Beach Boys and Brian Wilson (and that great Beach Boys concert we attended together in Fresno in August 1965) to our first surf band. I miss you, buddy! Jan Van Horn: For keeping surf music and surf guitar alive in me. You’re always steady as a rock and a triple musical threat: guitar, drums, and harmonica. Michael Karagosian: The recording engineer guru who now rules the digital cinema domain. Your view of reality keeps us all in check. Joel Lockman: A dear friend who has always laid down a solid bass foundation. Jeff Ball and Richard Eide: junior high school friends who were there in the beginning. Frank Wells, for his musical encouragement. My mom and my sister, for their love and understanding. And finally, my family: Janet, Martin, and Allison for all their love and support. Jim Lawrence, Mark Joyce, John White. the crew at McNeil Music: Eric Laine, Noah Drew, Don Pharoah, Jeff Howell, John Nolan, and Christian deBrigard. Also Geoff Glass, Christopher Woitach, Lynn Wiles, Joe Bruno, Rick Eleck, and of course, all my guitar students (former and present). Thank you!